In my last blog post I suggested that overcrowding on Earth isn’t sufficient reason to colonize other planets because there are still lots of alternative places we could inhabit right here on Mother Earth, like the deserts, the oceans, or even Antarctica. But getting a little more creative, there are still more interesting options to look at. Underground: There aren’t a lot of practical reasons we can’t live underground, more or less in giant skyscrapers that go down instead of up, at least in places amenable to digging deep holes (not in flood plains or coastal areas). A lot of SF books, including the hugely popular Wool series by Hugh Howey, have suggested that we might have to live that way in the event that some catastrophe makes the surface unliveable. We can get water, air, and energy down there, and the temperature is consistently warm. We just don’t like living where we can’t see the sun. But it’s conceivable that we might be able to manufacture sun lamps whose rays are very close to the real thing. Or even develop ways to channel real sunlight deep into the ground without much loss. Colonies on our Moon or the moons of the gas giant planets would likely be underground too. Even surface habitats beyond Mars would get very little sun. Up in the Air: One of the most exciting visuals in SFF movies is the floating city, which would probably require the discovery of antigravity. But there are other ways to live the high life. Airship technology using Kevlar fabric and recent energy and motor developments enables the creation of some truly gigantic platforms that can ply the stratosphere up above all that inconvenient weather, where solar power is abundant. The first commercial applications will probably be the stratellites being built by Sanswire and Tao Technologies for wireless communications, but who’s to say we won’t see stratospheric luxury condos sometime soon? It might not be feasible to house large populations that way, and access to staples other than energy (like food and water) might be problematic, but the available space is there. Mountains: There’s a lot of territory that’s unpopulated because flat floor space is at a premium. That said, we have lots of experience with construction on slopes (as opposed to, say, in a vacuum), and the main difficulty, as with airships, would be delivering food, water, and other goods to the homestead. But perhaps some improvement of the old pneumatic tube mail delivery system used in early office buildings could serve. Or maybe a variation based on magnetism. I’m not an engineer, but transportation and delivery of commodities is something we also have a lot of experience with, and the invention of new technologies might not be necessary. Digital space? Maybe Ray Kurzweil and others who herald the coming Singularity are right, and humanity will at some point dispense with physical bodies and merge with artificially intelligent machines or otherwise upload our consciousness into digital (i.e. virtual) real estate. Our physical space requirements would certainly drop (though no one really knows how much hard drive space a human would take up!) Especially if quantum computing becomes reliable, including storage media. You may say that’s much farther off in the future than Martian colonies but I’m not so sure. Information technologies have been developing at a faster rate than space tech lately, and its impossible to predict what sudden breakthroughs could arrive in either field and change the picture overnight. 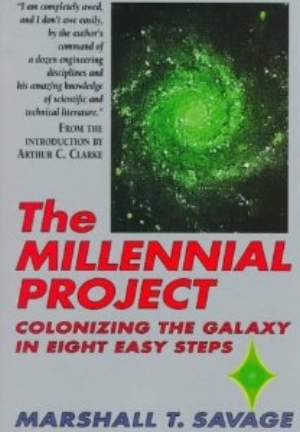 Even if you’re someone who’s intent on seeing humans colonize other worlds, futurists like Marshall T. Savage, author of the book The Millennial Project—Colonizing the Galaxy in Eight Easy Steps suggest that creating self-sustaining colonies in Earth environments like our oceans is important practice before we take the big step beyond our friendly ocean of air. Let’s make sure we can get it right here before we put lives at risk “out there”. From the perspective of a science fiction writer, I’ll still write about space colonies. It’s fun! But I just might direct a little more imaginative focus toward the creative ways we could use to keep calling Mother Earth home. WHAT WILL OUR GREAT-GREAT- GRANDCHILDREN BE LIKE? I have trouble writing stories about the far future—even one or two hundred years from now. I’m afraid they’ll end up like Star Trek and many other SF tales: essentially 21st century humans interacting with 23rd or 24th century technology. I’m sure it won’t really be that way, so to write scenarios like that feels knowingly misleading. You may think the people of the distant past were more primitive than we are, maybe even less intelligent. I disagree, and I think the great literature of history should be proof enough that our intellects, emotions, desires and motivations are really not different from our ancestors of many centuries ago. Our bodies aren’t either. But can we say that about our descendants of even a hundred years from now? Our physical bodies have been changing over the past generation and more because of our sedentary lifestyle and abundance of high-calorie foods—eventually adaptations will show up in our DNA—but technology will change us much sooner than that. We can also deliberately change our bodies in an increasing variety of ways. A not-quite-finished novel of mine postulates that within a few years smartphones will give way to direct brain-computer interfaces that we’ll routinely attach to, or even implant in our heads. Like Google Glass with a direct brain connection, they’ll keep us linked to the future version of the internet 24/7, to the point that we won’t know or care whether the answer to a question comes from our own memory or a digital database somewhere. Forget phone calls or texting—we’ll be able to communicate almost like telepathy, except that the messages will travel through the ‘net via wifi or its successor. I truly believe this will happen within decades, not centuries. Heck, by then artificial intelligence may have advanced to the point where our implant will have a mind of its own, like a little angel or devil sitting on our shoulder. Who can possibly guess how that will change our behavior? Futurist Ray Kurzweil has famously predicted that such a cultural shift (part of what he calls The Singularity) could happen as soon as 2045. Medical engineering will allow us to replace limbs and other body parts with efficient and more versatile replacements that will make the Six Million Dollar Man look quaint. Within the lifetime of most of us, we’ll probably undergo medical procedures that will involve nano-devices travelling our bloodstream to pinpoint problems and maybe even treat them. (And a little internal ‘nip & tuck’ while they’re at it? Why not?) Geneticists are making great advances in deciphering and manipulating DNA. Screening embryos for desirable traits might become routine. Perhaps we’ll even be able to get injections of DNA cocktails or nano-gadgets that will replace plastic surgery in making us stronger, more youthful, and more attractive. My point is, in a hundred years from now human beings won’t be the same as we’ve been for millennia, and an author who doesn’t reflect that in their vision of the future is missing the mark. That’s what makes this job so hard. Or just think of it as a challenge. Yeah, that sounds better.